Featuring a classic hand-tied wired burlap bow, our new Country Meadow Rose Swag is a variation of one of our best selling floral arrangements: The Mountain Meadow Rose Swag ... This nature inspired floral arrangement is beautifully hand-crafted with huck branches, kunzia, preserved salal, preserved eucalyptus, fern, natural grasses, nigella pods, preserved statice, larkspur, green moss, and handmade roses. 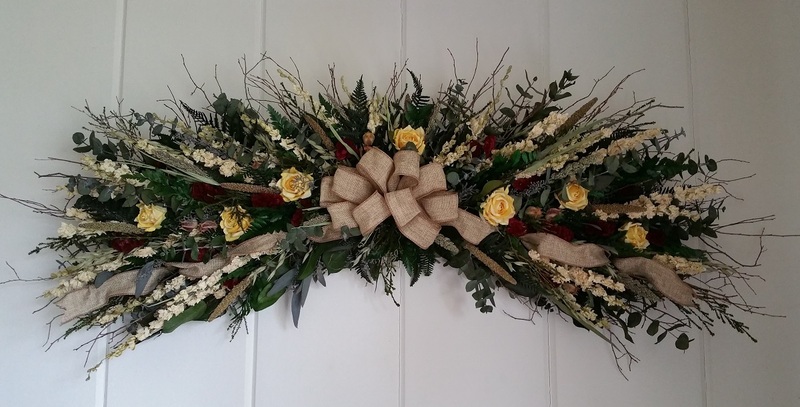 Swag shown is 36"L x 12"H.
The wreath arrived!! It is **BEAUTIFUL**! I can't possibly thank you enough for all of your hard work and sincere email communication to accomplish this task via email! You have a soft, gold heart with angel wings! I hope that you took pictures of the finished project to display in your shop!